NASA Earth Observatory images by Joshua Stevens, using data from the National Snow and Ice Data Center and NCEP reanalysis data provided by the NOAA/OAR/ESRL PSD. Story by Kathryn Hansen with reporting by Maria-José Viñas/NASA’s Earth Science News Team. 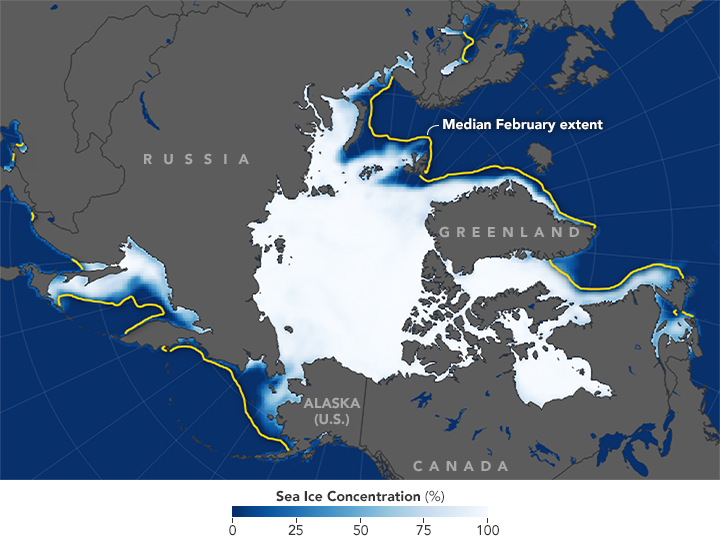 Arctic sea ice reaches its maximum extent each March, following months of growth during usually frigid and dark autumn and winter. The date of maximum extent for winter 2018 has yet to be determined, but in February 2018, the average ice extent was the lowest of any February on record. The February extent averaged 13.95 million square kilometers (5.39 million square miles), according to the National Snow & Ice Data Center. That is 1.35 million square kilometers below the 1981–2010 average for February. The chart below shows how Arctic sea ice growth this year compares with all years since 1979. The lackluster ice growth—and the decline in areas such as the Bering and Chukchi seas—was influenced by a so-called “winter warming event.” (Read about the complex chain of events that lead to these events here.) Low pressure off of Greenland and high pressure over Europe helped move warm air masses—and possibly some warm water—from the North Atlantic into the Arctic Ocean. A similar scenario also played out on the Pacific side: low- and high-pressure systems set up in such a way as to move warm air and water from the North Pacific through the Bering Strait. “We have seen winter warming events before, but they’re becoming more frequent and more intense,” said Alek Petty, a sea ice researcher at NASA’s Goddard Space Flight Center. Areas of unusual warmth are visible in the second map, which shows air temperature anomalies for February 2018. 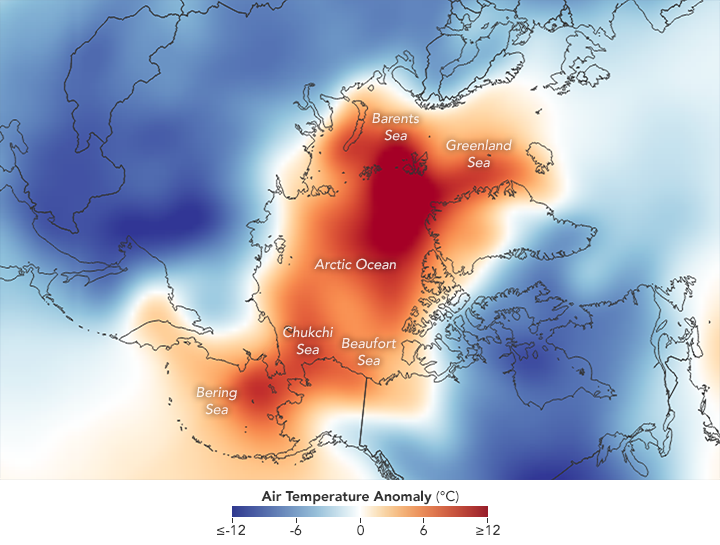 Red and orange colors depict areas that were hotter than average; blues were colder than average. At times, the North Pole saw temperatures climb above freezing, soaring 20 to 30 degrees Celsius (36 to 54 degrees Fahrenheit) above the norm. Notice the area north of Greenland. This is the site of another exceptional event this winter: open water instead of sea ice cover. Without the ice cover here, heat is being released from the ocean to the atmosphere, making the sea ice more vulnerable to further melting. NASA’s Operation IceBridge—an airborne mission to map polar ice—will make measurements in the area when annual science flights resume in late March. 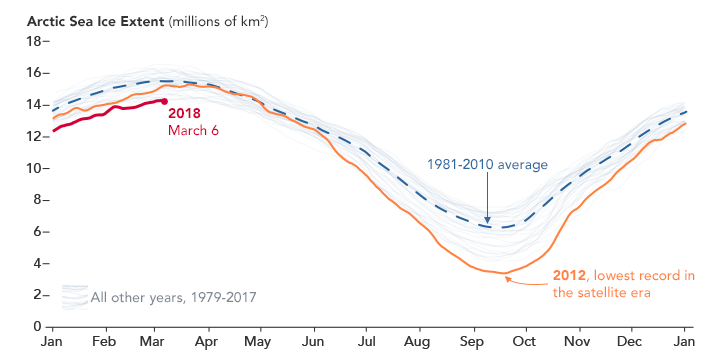 The Conversation (2018, March 1) The freak warm Arctic weather is unusual, but getting less so. Accessed March 8, 2018. Discover blogs, ImaGeo (2018, February 26) Freakishly warm air has again surged over the North Pole, and sea ice is breaking up north of Greenland—in winter. Accessed March 8, 2018. Earther (2018, February 23) Has the Arctic Finally Reached a Tipping Point? Accessed March 8, 2018. Goddard Media Studios (2018, February 28) NASA Studies an Unusual Arctic Warming Event. Mashable (2018, February 26) Drastic Arctic warm event stuns scientists, as record-breaking temperatures reach the North Pole. Accessed March 8, 2018. NASA Goddard (2016, November 14) Extremely Warm 2015–’16 Winter Cyclone Weakened Arctic Sea Ice Pack. National Snow & Ice Data Center (2018, March 6) A warm approach to the equinox. Accessed March 8, 2018. The Washington Post (2018, March 6) Science Says: Arctic not so chill this record warm winter. Accessed March 8, 2018. The Washington Post, Capital Weather Gang (2018, February 26) North Pole surges above freezing in the dead of winter, stunning scientists. Accessed March 8, 2018.